The Seattle market has gotten hotter and hotter with every passing month so far this year, the latest Case-Shiller report shows. Another study finds that only about a quarter of homes in King County now sell for less than half a million dollars. 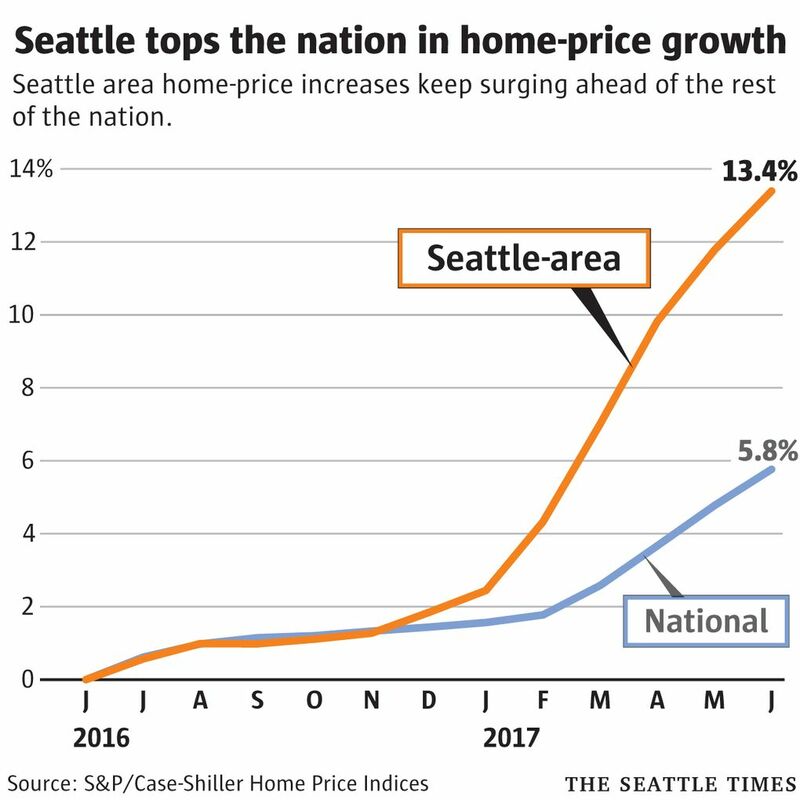 The Seattle-area home market keeps picking up steam, with prices rising faster than anywhere else in the country for the 10th straight month. The typical single-family home cost across the region soared 13.4 percent in June from a year prior, according to the monthly Case-Shiller home price index, released Tuesday. No other region was close; Portland was second, with 8.2 percent growth in home values. The Seattle market has gotten hotter and hotter with every passing month so far this year. All segments of the market have been affected, from starter homes to luxury mansions, and from historically cheaper neighborhoods to upper-class enclaves and everywhere in between. The last time prices were rising this fast locally was the 2006 bubble, when prices rocketed up nearly 20 percent in a year before crashing back down during the recession. No city in the country has seen prices soar this fast since the San Francisco market exploded three years ago. Prices here are again rising more than twice as fast as the national average. Across the country, home costs increased 5.8 percent. Home prices have now skyrocketed 78 percent since bottoming out five years ago. And they’re up 19 percent over the old bubble high from last decade. 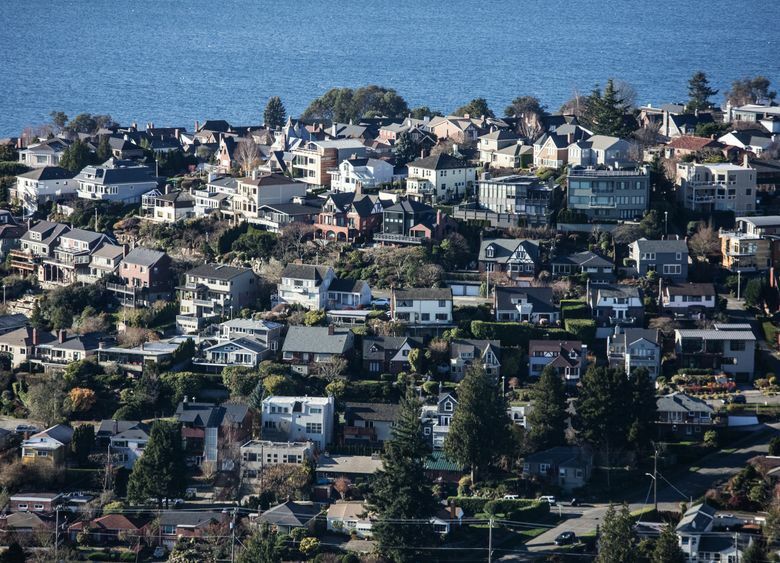 The typical home in Seattle now costs nearly $750,000, while it’s $860,000 on the Eastside. Buyers looking for a glimmer of somewhat good news can focus on this: Compared to just a month ago, prices in the Seattle region are up 1.4 percent. That’s the second-highest in the country, behind Detroit, but the slowest for the Seattle region since the start of the year. Prices continue to soar around the state, as well. The new statewide median home has hit a record price of $337,700, according to a quarterly report released Monday by the University of Washington’s Runstad Center for Real Estate Studies. Prices rose in every metropolitan area in the state. Compared to a year ago, home values grew 16 percent in Clark County, 15 percent in Whatcom County and 12 percent in Yakima County. The Runstad report noted that just 27 percent of all homes in King County now sell for less than $500,000. Just two years ago, about half of homes in the area sold for under $500,000.